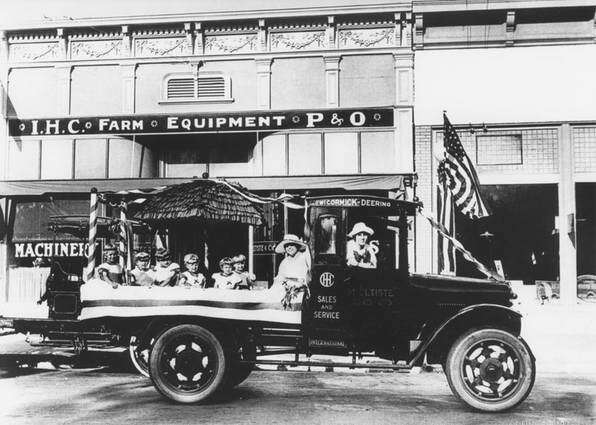 M. Eltiste & Co. truck decorated as a parade float, Orange, California. Image shows truck decorated with patriotic bunting with several children sitting beneath a ruffled umbrella in the truck bed, parked in front of the M. Eltiste & Co. Farm Equipment business at 161 North Glassell Street, Orange, California. Children, wearing costumes decorated with an "X", are identified left to right as Lucille, Evelyn and Greta Eltiste, with four children unidentified, and Mrs. Dutze sitting in the cab of the truck.